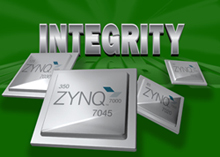 The Xilinx Zynq-7000 EPP tightly integrates an ARM® dual-core Cortex™-A9 processor with low-power programmable logic for embedded software developers to customize their systems by adding peripherals and accelerators into the programmable logic. Protects hardware and software IP during all facets of the manufacturing process against counterfeiting, cloning and other tampering. Complete set of C- language cryptographic algorithms validated to FIPS 140-2 level 1 and meeting the NSA Suite B Standard. Green Hills Compilers take advantage of advanced optimization strategies developed for the latest embedded processors. In addition, the Green Hills Compiler for the ARM processor generates architecture-specific and even processor-specific optimizations to use the pipeline and instruction set characteristics. A complete implementation of the C, C++, and EC++ libraries are included in compiler distributions. Full featured start-up code and libraries include automatic copy of data from ROM to RAM and system call emulation. Green Hills C/C++ compilers fully confirm to ANSI/ISP industry standards and include optional enforcement of MISRA C programming guidelines. Bare Board Access (no OS)—MULTI supports targets connected through JTAG headers on the board. Vybrid is supported with the Green Hills Probe and SuperTrace Probe, ARM Multi-ICE™ and EmbeddedICE™, Macraigor Wiggler and Raven, and Agilent Emulation Probe™. MULTI, when used with the Green Hills SuperTrace Probe, supports ARM’s Coresight and Embedded Trace Macrocell (ETM) with trace and trigger GUIs that facilitate capture, control and analysis of real-time trace data. Commercial RTOS Support—MULTI supports ARM boards running Green Hills Software's INTEGRITY and µ-velOSity real time operating systems. MULTI provides kernel and multitask-aware debugging. Special commands allow tasks to be stopped upon system events such as task creation. Run-mode debugging*—Run-Mode enables source debugging of one or more threads of execution within their own debug windows, allowing the rest of the system to continue to run, handling real-time events. This advanced feature adds very little overhead to the embedded program making it ideal for deeply embedded real-time applications. Custom RTOS support—MULTI can be interfaced with a custom RTOS through integration of the Green Hills debug agent. Instruction set simulator—The SimARM instruction set simulator interpretively executes ARM programs on the host PC or workstation without the need for target hardware by simulating the execution of the target processor at the instruction level. SimARM provides full debug features, host I/O, command window, extended profiling and hardware breakpoints. DoubleCheck finds code sequences that may result in buffer overflows, resource leaks, and many other security and reliability problems. It is effective at locating a significant class of defects that are not detected by compilers during standard builds and often go undetected during run-time testing or typical field operation. DoubleCheck is built into the Green Hills C/C++ compiler, taking advantage of accurate and efficient analysis algorithms that have been tuned and field proven over the past 28 years. DoubleCheck can be used as a single integrated tool to perform compilation and defect analysis in the same pass. *Run-mode debugging is configuration-dependent and requires custom integration. Please contact your local sales representative for further information.